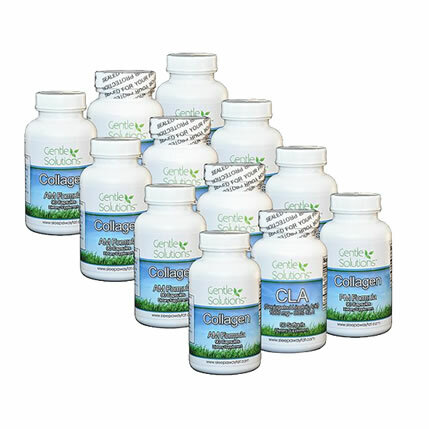 4-month supply of Gentle Solutions Collagen AM, Gentle Solutions Collagen PM, Gentle Solutions C.L.A. a complimentary pill box and a complimentary tape measure. Split this package with a buddy for a great savings! Special 4-month supply of Gentle Solutions Collagen AM, Gentle Solutions Collagen PM, Gentle Solutions C.L.A. a complimentary pill box and a complimentary tape measure. I have lost a Total of 38 pounds so far with the help of the Tummy Saver Package!! This has been a very easy program to follow. LOVE YOUR PRODUCT! I have lost a total of 58 lbs since Aug. 09. It also made my Arthritis easier to deal with as it eleviated my joint pain! Thank-you! !